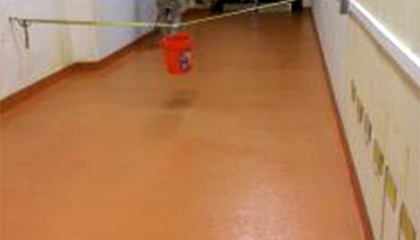 Food and beverage industrial flooring must balance rigorous safety compliance with functionality. The operations and service area flooring should heighten safety and productivity under constant motion. Black Bear Coatings & Concrete engineers slip resistant, durable flooring to accommodate high-traffic areas and abrasive cleansers commonly used in the food & beverage industry. Our flooring options are designed to endure the unique set of stressors found in food & beverage manufacturing areas, including aggressive wash-downs with harsh chemicals, and high temperature cleanings to resist the threat of bacterial contamination. Black Bear is highly-trained and experienced in all areas of chemical resistance coatings, secondary containment, thermal shock, electrostatic dissipation and other site considerations. We ensure the project is completed to your satisfaction and compliant with the necessary regulations. Black Bear has engineered solutions for several food service and manufacturing clients in New England and beyond including: Shaw’s Supermarket, Millennium Pharmaceutical Cafe and Vitasoy. Talk to Black Bear about designing and installing a cost-effective, durable surface for your food and beverage industrial flooring space. Fill out the online form and a client representative will be in touch. Or, please call 978-405-0017. To learn more about industrial flooring for the food and beverage industry, check out our guide to choosing the right flooring for restaurants and other food establishments.